These 2019 1 oz British Silver Britannia coins are produced by the United Kingdom’s prestigious Royal Mint. These silver bullion coins are the 2019 addition to the popular Silver Britannia coin series which was initiated in 1997. Each coin contains one (1) troy oz .999 pure silver bullion. Minted at the Royal Mint in Great Britain. Each coin has a £2 legal tender face value in Great Britain. Sovereign coins guaranteed by the United Kingdom. Lots of 25 coins are packaged and safely shipped in official Royal Mint tubes. Lots of 500 ship in a mint sealed box. These are official sovereign silver coins guaranteed by the British government. You can find also other years of official United Kingdom Royal Mint coins available here. The reverse of the coin has the famous Britannia figure struck upon it. Britannia is the female embodiment of Great Britain depicted in a classic toga wearing a war helmet as she stands vigilantly poised for battle. In one hand she holds a trident in honor of Britain’s naval prowess while in the other hand she holds an olive branch with a round shield bearing the union jack symbol. These items represent the British navy’s duty to protect the peace of the nation by any means necessary. The coin’s reverse is also stamped in English with the coin’s guaranteed weight, purity, country, and year of mintage. On the obverse side of the coin is another female’s image who has come to embody Great Britain, Queen Elizabeth II. The monarch is portrayed in profile, regally attired in her trademark diadem. 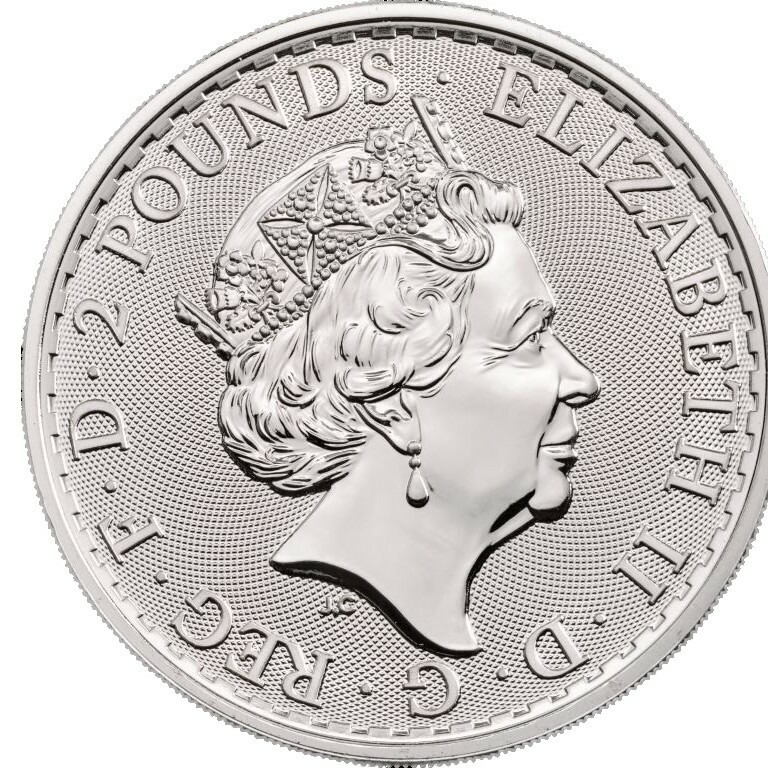 Stamped on the front of the coin is the queen’s name (Elizabeth II), the coin’s legal tender 2 pound denomination, and the Latin abbreviation for “Dei Gratia Regina” which translates into “Queen by the Grace of God”. 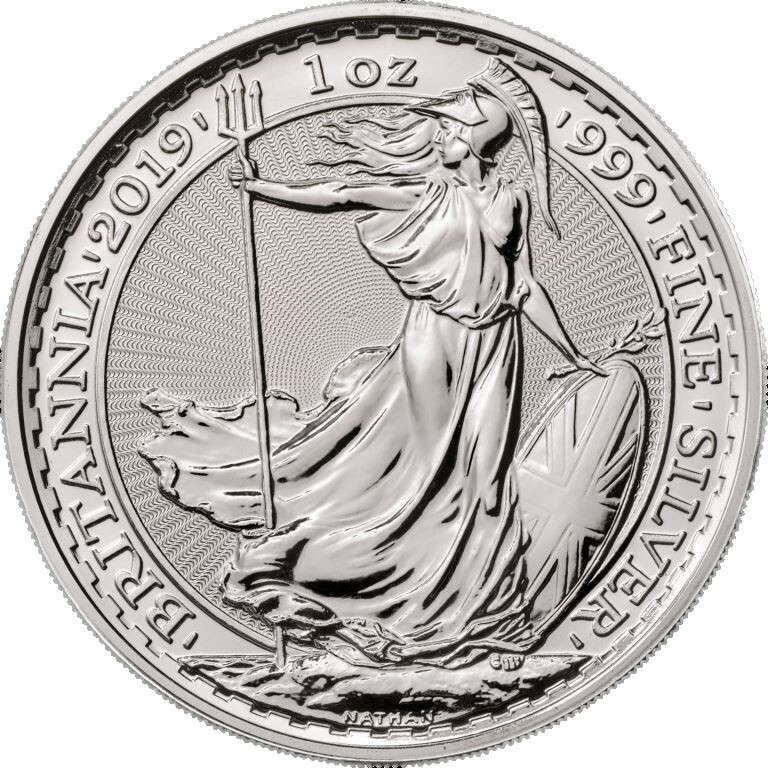 This 2019 British Silver Britannia tube of 25 one ounce coins is offered at a comparatively lower premium per ounce and lower annual mintage figures than many other sovereign mint coins, such as the American Silver Eagle. As Low As $1.89 Over Spot!